Vancouver has earned itself a healthy reputation as Vancouverites regularly enjoy runs, yoga and cycling among other things. Compared to some of its counterparts mentioned, cycling is no cheap hobby. From entry level cycles to those that are products of state of the art engineering, maintenance plays an utmost important role in the longevity and performance of any bike. But, who wants to lug their bike to the shop or, even worse, getting their own hands greasy? 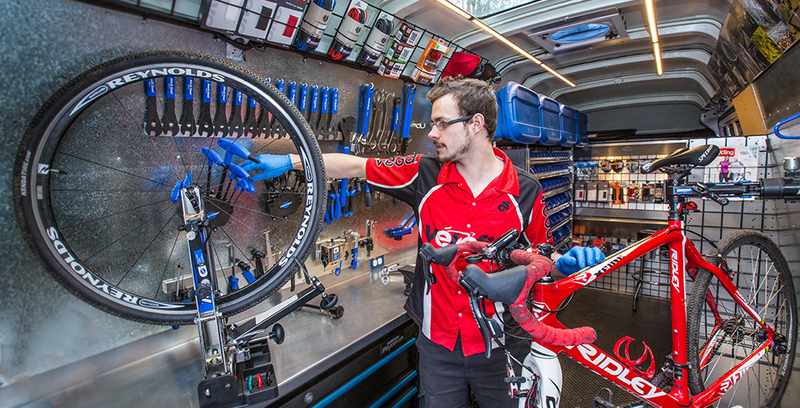 Velofix is a one stop shop that provides mobile, on-demand servicing for your cycle. Chris Guillemet, CEO and Co-Founder of Velofix. Our business is the largest fleet of mobile bike shops in North America (a fully operational bike shop in a Mercedes Sprinter Van). We (including co-founders Davide Xausa and Boris Martin) were inspired to start Velofix due to the constant frustration of trying to get our bikes serviced. Convincing suppliers to sell to us. The bike industry hasn’t changed much over the years in terms of the retail and service environment. We convinced suppliers we would provide a premium service to cyclists and we paid all of our bills on time. It also helped going from one van to 27 franchises now sold – volume speaks louder than words. How has Vancouver’s rising startup community played a role in the development of Velofix? Many of our best clients (both corporate and individuals) are entrepreneurs and we work with companies like Vega and Hootsuite. Cycling is a huge part of the company culture in many startups. “Save Time. Ride More” is our tag line and our business provides a professional and convenient service. The Bike Shops comes to you – your home, your office, wherever you need your bike(s) serviced. Frustration with how things were being done! A major challenge was being too conservative – there’s a point where you have to “step off the cliff” and just go for it. Charles Chang from Vega and Jim Treliving/George Melville from Boston Pizza – they are investors in our business. They are special because they built their business from the ground up and they have never forgotten where they came from. They’re all very humble guys who truly want to see others succeed. We could probably find some space in our office for Jimmy Pattison. The man is a business legend and still looks very healthy and strong. Just go for it and don’t be afraid to fail! Books! Read, read and then read more! Learn from others who have gone through the same process to launch and grow their business. Surround yourself with other people going through the same challenges/issues. Ask for advice and help from people who have done it! You will be amazed how many successful people will take the time to provide support. You can follow Velofix on Facebook, Instagram and Twitter or find them online at www.velofix.com.